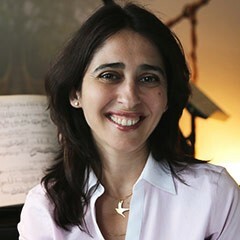 RAKEFET HAK, one of the youngest pianists ever to join the Metropolitan Opera’s musical staff, and the first Israeli in history to do so, has coached and/or performed in recital with such notable singers as Cecilia Bartoli, Placido Domingo, Rene Fleming, Dmitri Hvorostovsky, Simon Keenleyside, Philip Langridge, Suzanne Mentzer, Kurt Moll, Patricia Racette, Bryn Terfel, Carol Vaness, and Deborah Voigt. After graduating with excellence in piano performance from conservatory in her native Israel, Ms. Hak was coach/accompanist for the New Israeli Opera. She pursued further study at the Hartt School of Music and Manhattan School of Music, and in 1997 she attracted the attention of the Metropolitan Opera administration. She began her tenure at the Met as coach for the Lindemann Young Artist Development Program, soon joining the main company as assistant conductor and coach on a variety of productions, including Die Zauberflote, Le nozze di Figaro, Die Fledermaus, La Traviata, Aida, and Il barbiere di Siviglia under Maestros James Levine, Jun Markl, Sebastian Weigl, Placido Domingo, Bruno Campanella, Carlo Rizzi, Paul Nadler, Patrick Summers, Edo de Waart, and Julius Rudel, among others. Ms. Hak was recruited in 2000 by Placido Domingo to join Los Angeles Opera’s music staff. First working with Maestro Domingo as assistant conductor for Aida, she later assisted Maestros Kent Nagano, John DeMain, Richard Armstrong, and traveled with the company for Don Giovanni, conducted by Roderick Brydon in Finland. Ms. Hak was recently engaged by the Seattle Opera as coach/accompanist for their co-production with the Metropolitan Opera of Iphigenie en Tauride, conducted by Mr. Gary Thor Wedow. Other performances include recitals at Weill Recital Hall at Carnegie Hall, New York’s Town Hall, the Tilles Center of Long Island, and the Lincoln Theater of Miami. Ms. Hak has also performed for National Public Radio, WQXR (for the Marilyn Horne Foundation), the Chamber Music Society of Lincoln Center, and the Institute of Vocal Arts in Italy.